Two basketball players embrace after an emotional win. They envied the trophies that the boys would win every year and regretted that there was never an opportunity for them to learn a sport and compete. I was shocked at first that the girls had a desire to participate in sports because whenever I observed sports lessons, they would always sit on the benches taking selfies. Then it occurred to me perhaps they just needed an opportunity in a comfortable environment to learn and play. My counterpart and I arranged a meeting with our education resource center and the sports teachers in our municipality. We wanted to see if there were any other schools that had interest in starting a basketball team so that our schools could compete against each other and we could create a municipality league. 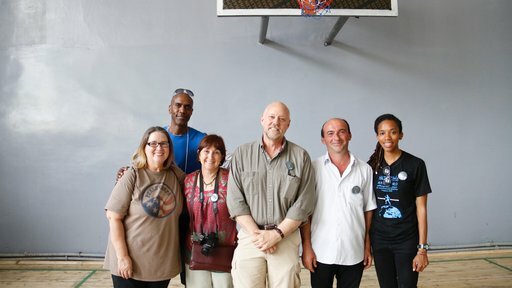 Twenty-one sports teachers attended this meeting and 11 committed to creating a girls' basketball team at their school. We had eight girls’ basketball teams in our league, each with eight to nine participants. 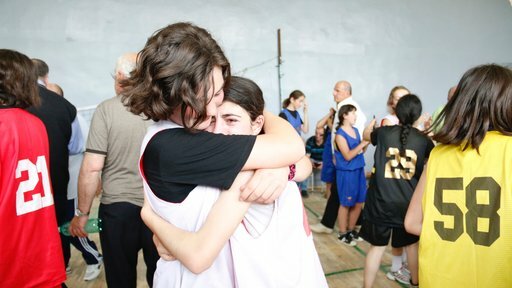 About 70 girls participated in the basketball league. We applied for a Peace Corps Partnership Program grant. This grant and our town mayor, who agreed that there should be more opportunities for girls in sports in our community, funded a two-day health, fitness and girls’ basketball training and training materials for each team. The girls were required to practice a minimum of two days a week in order to receive two basketballs for the team, uniforms, practice shirts and practice cones. The first day of the training focused on health and the importance of fitness and physical activity. Coaches attended the training, which covered coaching techniques and best practices drills. Georgian Olympian and President of “Sport for All” Maia Azarashvili gave an inspiring speech on the first day about how people in her community and in Georgian society had expectations about what she should be doing since she’s a woman and how she had to run past that in order to reach her goals. The second day of training successfully taught the girls basic basketball skills to further develop when practicing with their sports teachers. The girls spent 15 to 20 minutes at stations learning dribbling, defense, shooting mechanics, passing and basic basketball plays. Five of my Peace Corps friends helped to facilitate each station alongside of two of the coaches. After the final Girls' Basketball League game. The Girls' Basketball League competition began two weeks following the training. The gym was packed every game. We had to invite the police in advance for the semi-final and final games to help ensure the gym did not burst over its capacity limits. Students were climbing the windows to watch the game from outside. This was the first time the girls had ever played in an organized sports league in my town and played basketball in general. They asked my counterpart, the education resource specialist, and me to promise them that we would have the league again next year. Since then, basketball has become really popular in our town. The basketball courts are always full of pick-up games. I even see fourth graders now playing basketball during sports lessons and students walking around town dribbling a ball. Even our schoolteachers were motivated to engage in a physical fitness activity and organized "Teachers' Olympics." Ari Hires is an English education Volunteer in Georgia.